The Winter 2012 issue of Creative Scrapbooker Magazine was filled with wintery, Christmasy ideas AND a fabulous tutorial on how to use Spectrum Noir Markers written by our beloved Christy Riopel. In this issue Christy walked you through a few basic techniques using Spectrum Noir markers and then demonstrated a real crazy technique using rubbing alcohol that I will share on another day! LOL! Sorry!!!!! Today I am sharing with you a layout Christy designed for the article demonstrating how to crete a Halo Effect with your Spectrum Noir markers or any alcohol based markers that you have on hand. Here is the stunning layout. SUPPLIES: Bo Bunny patterned paper and stickers, Spectrum Noir Markers and smooth cardstock, Memento ink, Bazzill cardstock, unknown gesso, Scrapbook Adhesives by 3L. Create a very subtle halo effect with your Spectrum Noir markers in a few very simple steps. 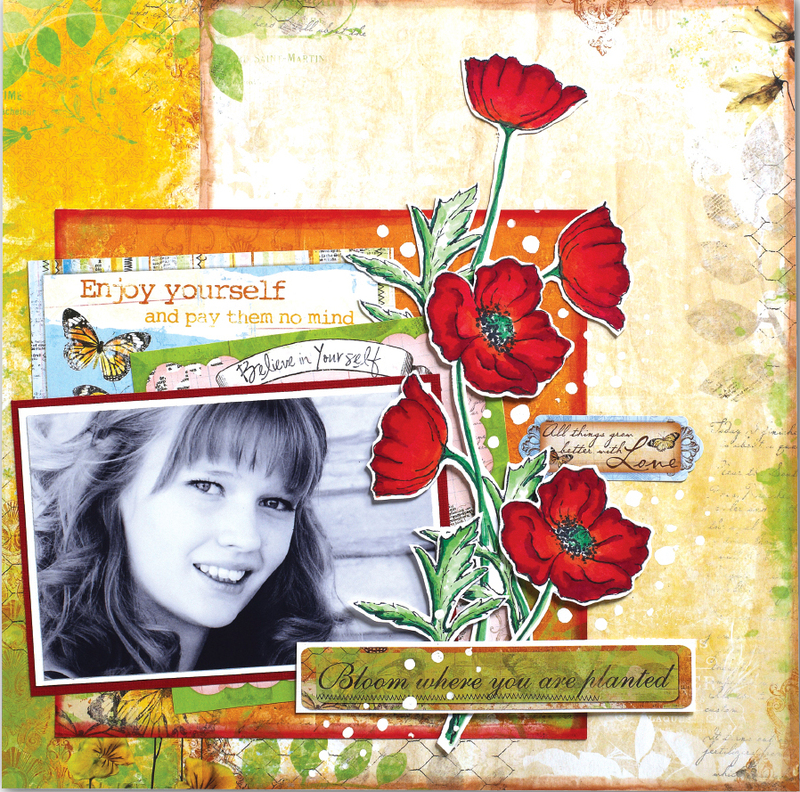 This very soft highlight really makes the photo on Christy’s layout pop from the page. Not to mention how incredibly stunning those poppies are! LOVE IT! Dust off your winter 2012 issue of Creative Scrapbooker Magazine. The projects and techniques are TIMELESS!!!!!! I encourage you to keep every single issue as each and every copy of Creative Scrapbooker Magazine is filled with technique-rich projects that can be used over and over again!